Going forward I will be writing blogs from my healing experiences on common ailments as I feel this will be very useful for people who want to avoid modern medication and doctor’s visit 🙂 or just lessen them. I love to take up energetic healing sessions however with my corporate job at times it is tough to accommodate them 🙂 but some clients are just meant to be healed. I am writing about an interesting case of cervical issue. Cervical vertebrae are the seven vertebrae that help in flexing our neck and they act as a bridge between the body and the head area. The cervical vertebra protects the cervical nerves which control certain areas of the head, neck and upper back, including the arms and hands. Shoulders – represent our ability to carry our experiences in our life joyously, we make life a burden by our attitude. Once we know the emotional causes it is easy to understand that physical issues are mere symptoms but the real cause are mostly psychological in nature. 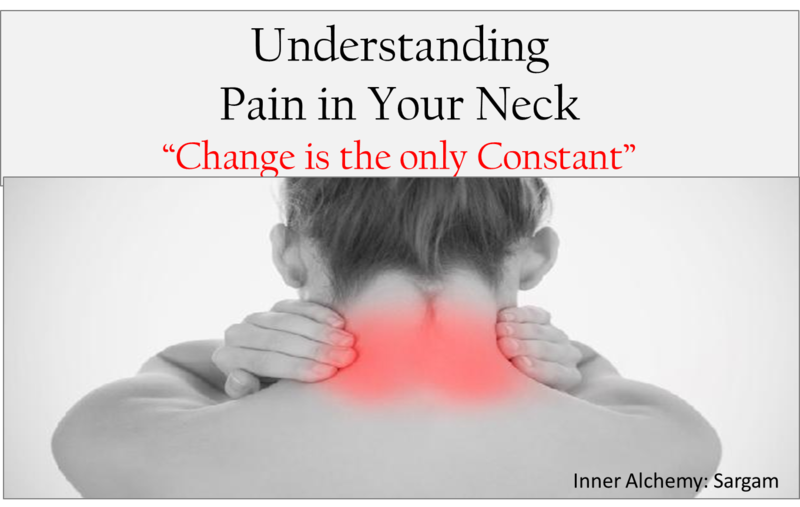 As a Pranic Healer a week of healing helps align the vertebra and ease cervical pain (the duration may vary from healer to healer and also receptivity of patient). Alternative Su Jok therapy is also found useful. Self Healing Creative Visualisation for Spine Wellbeing: This is an awesome meditation to do it yourself , it has had amazing healing effect on people and it assists in faster healing of back pain at the comfort of your home. 2. Salt Water Bath: Salt water bath is extremely useful in relieving pain you can also use few drops of lavender oil in your bathing water. It will help disintegrate dirty diseased energy from you aura. This Mantra is useful for healing physical and astral bodies. 5. Pranic Psychotherapy and Pranic Healing : Consult your Pranic Healer the pain and disease are only symptoms we need to understand the cause and heal it. Any type of pain in neck should not be avoided because you may be thinking it a pain only but it might be a first stage of Cervical spondylosis. Right excess exercise, poor posture, sitting long are few reasons of such pain.